Pretty much every time I go out for beers with my friend Sarah, I go, “Wait, what are hops? Are those the ones I like? Do I like lager? What’s an ale?” I don’t know why. She has never claimed to know very much about beer. The original idea for this post was: It’s hot out this week and I don’t feel like cooking. I should do a “How to: drink beer” post and it will be like, open a beer and put it in your mouth. But then I realized that was dumb and not funny. -Lager is like normal beer—Budweiser, Miller, etc. (There are good lagers out there, though!) They are made with bottom-fermenting yeast, and they ferment at colder temperatures. Lagers are described as crisp, clean, etc. I have totally lost the thread of this post. Right now I’m drinking Tenacious Traveler, from the House of Shandy Beer Co. It tastes like ginger and lemon (it tastes more like a shandy—beer+lemonade—than it does like beer); it’s really, really weird. You can’t really taste anything other than the ginger and lemon. I am mostly just mystified by the fact that they had it in my utterly sketchy East Harlem bodega. I’ve never heard of it before. But the label has a guy with a mustache, so that’s nice. I have a very minor obsession with seasonal beer, so I may start commenting on them here. (The minor obsession just means that I usually get the seasonal beer when it’s on tap. But I think everyone does this. Also, this is more true in the fall, when I am on the ever-important quest for pumpkin beer.) Good night. Part of the mission of this blog is trying things that will probably fail, just to see if they don’t. That isn’t really what I meant. I mean… things that are long shots. Unlikely to succeed. Spectacularly charming messes. So the other day, I had fifteen minutes to get to a picnic to which I had promised to bring “alcohol in a subtle container.” (I think drinking in Central Park is illegal.) I then discovered that, according to the Internet, sangría should chill in the fridge for a minimum of four hours. So I was like, screw it, I will do it anyway, and people will probably drink it. I chopped up 1 Gala apple and about half a pint (no… are pints the really small containers? Maybe half of two pints, then) of surprisingly ripe-looking strawberries. I put them in my bright red Nalgene, and then filled it to the brim with as much white wine as I could fit. (I bought extremely cheap wine—because I love you, dear friends—figuring that if you’re going to sangría-ize it the quality is maybe not so important. No offense, Barefoot Wine.) It was about 3/4 of the bottle. Maybe 7/8. Then… and this is the truly shameful part… I closed the Nalgene and SHOOK IT OVER THE SINK as if I were making salad dressing. I put it in the freezer for approximately three minutes. 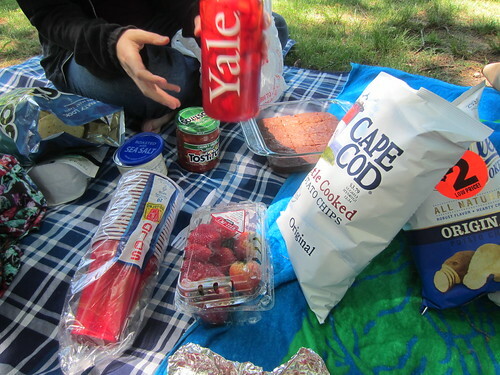 Then we went to the picnic. It was declared “drinkable” and “not bad.” Well, at the end of the picnic we found a full Solo cup (we’re still young, it’s OK), so someone didn’t like it, but I don’t know who. I was going to make disparaging comments about that unknown person, but actually they might just be a very classy person with good taste in wine.